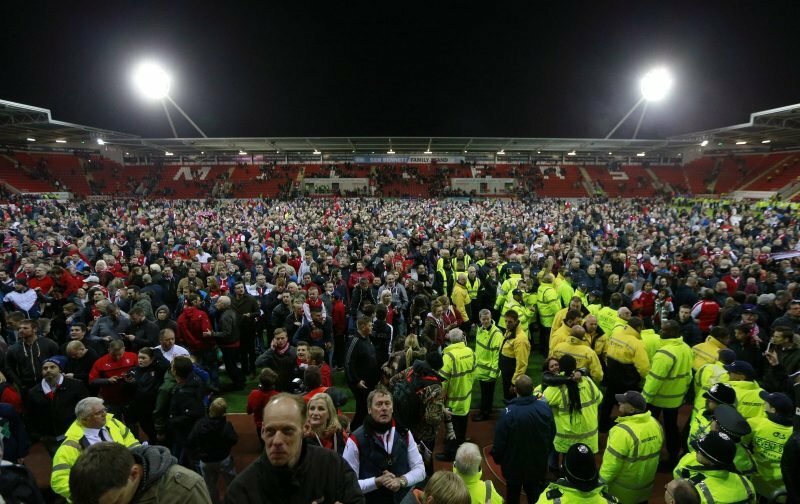 Rotherham United are on their way to Wembley where they will face Shrewsbury Town after beating Scunthorpe United two-nil at the New York Stadium this evening making it four-two on aggregate in the League One Play-Off Semi-Final. and then when a Richie Towell curling effort looked like it was going into the top corner he sprung into action and clawed it away for a corner. With five minutes left of the half Joe Newell took the ball off Duane Holmes and sent a cross towards Michael Smith which was blocked before it reached him. As the board went up for two minutes of time added on (two minutes? I was actually expecting six the time the Iron’s trainer was on the pitch) Watson again did well to keep out a low drive from Matty Palmer. But he could do nothing a minute later when a long Will Vaulks throw went into the area and Millers’ skipper Richard Wood rose above everyone else to head the ball into the net. The Iron could have equalised in the opening minutes of the second half when Duane Holmes raced in with the ball at his feet but a bit of a heavy touch gave Marek Rodak the advantage and he rushed out to claim the ball. The first substitute of the evening saw Semi Ajayi replace Michael Ihiekwe for the hosts and the first yellow of the evening followed two minutes later after Ivan Toney was booked for a poor challenge on Richard Wood and two minutes later Rory McArdle was also booked after he smashed into Ryan Williams after the ball had gone. Scunthorpe brought on Cameron McGeehan for Hakeeb Adelakun. On the sixty-third minute Rotherham doubled their lead after some nice football saw Josh Emmanuel put a good cross in which eventually fell to Will Vaulks who shot home from some ten yards in front of an ecstatic ten thousand home fans before his tell-tale back flip finished the move. Like Saturday the visitors could have pulled one back straight away when a cross from Josh Morris beat the outstretched hand of Marek Rodak and when it looked like Toney would put it into the back of the net there was Ajayi and Wood standing strong to stop it happening. Not recovering from the earlier knock Ryan Williams received a standing ovation when he was replaced by Jon Taylor. And Toney might have scored again when he got round the Millers’ ‘keeper but Joe Mattock was back to clear which was followed by a goal mouth scramble seeing Rodak have a bit of a brainstorm and dash out but both Toney and Morris failed to capitalise. With twenty minutes to go Cameron McGeehan was only a posts width of getting a header in before a ball from Morris found Holmes who one-on-one with the ‘keeper couldn’t beat Rodak who came away with a goal-kick. A clumsy foul on Joe Newell from McArdle saw him receive a second yellow from referee Scott Duncan and the visitors were down to ten men and soon afterwards Lee Novak came on for Ivan Toney and minutes later Tom Hopper came on for Ryan Yates. Another fantastic save from Roadak stopped Holmes scoring and at the other end Newell had another chance after he flew down the pitch but saw it go wide. As the board went up for seven minutes of time added on Anthony Forde came on for Newell for the Millers. McGeehan and Morris had chances, the first going wide the second another save from the Millers’ ‘keeper. In the dying minutes of the game Forde saw yellow for a poor challenge on Holmes. As the final whistle blew it was a signal for a mass celebration with fans flying onto the pitch and for the fans still in the stands all looking forward to another trip to Wembley. What can you say – not a great performance perhaps but a win and a clean sheet and a trip to London – you can’t ask for much more.